Funny book lovers, welcome back for another glorious New Comic Day. 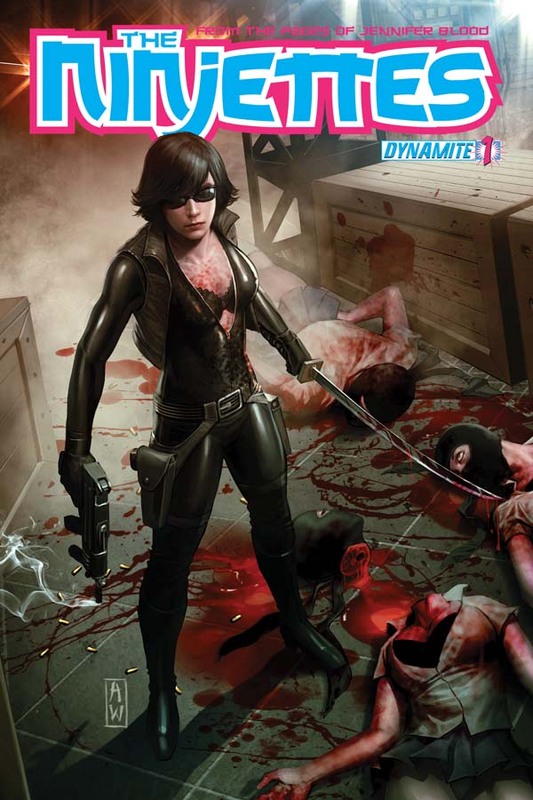 The winner for this week comes attached to the debut issue in a new series from Dynamite Entertainment entitled Ninjettes. I've seen the solicitation in Previews, but didn't feel intrigued enough to pre-order it. But I still like this cover. Check out the image below and follow for discussion. Credit for this lovely woman clutching the katana goes to Admira Wijaya. What's not to love here? Before I touch that, I don't know anything about the series this title spun-off of, so I'm going to call her the mysterious lady. Ok, so we have a mysterious lady in all black, including the sunglasses. She's got a smoking gun in one hand and a katana (my favorite weapon) in the other. Duel-wielding, ok, I can digg it. But that's not all. Behind, and on the side of her are three very dead women. One of whom may be feeling separation anxiety from her dome. Well, you know, if she weren't dead. And who doesn't enjoy a nice decapitation every once in a while? I don't really know why she's unzipped partially and her bra is exposed, but that's comics for ya I guess. Well I know why, I just see the need for it is what I should say. But anyway, I still like the cover. Love it? I'm sure you do. Let me know. Thanks for looking.